Nursing students and graduates provide wound care for those in need. The Salvation Army partnered with University of Hawaii Maui College (UH Maui) nursing students and graduates to provide wound care for the community’s most vulnerable residents. Mark Saxon, Homeless Outreach Coordinator for the Kahului Corps, and Kahului Corps Officer Lt. Romelia Howard visited homeless encampments in Kihei to provide food, clean clothing and spiritual services. Nursing students and graduates of UH Maui attended to individuals in need of medical services. 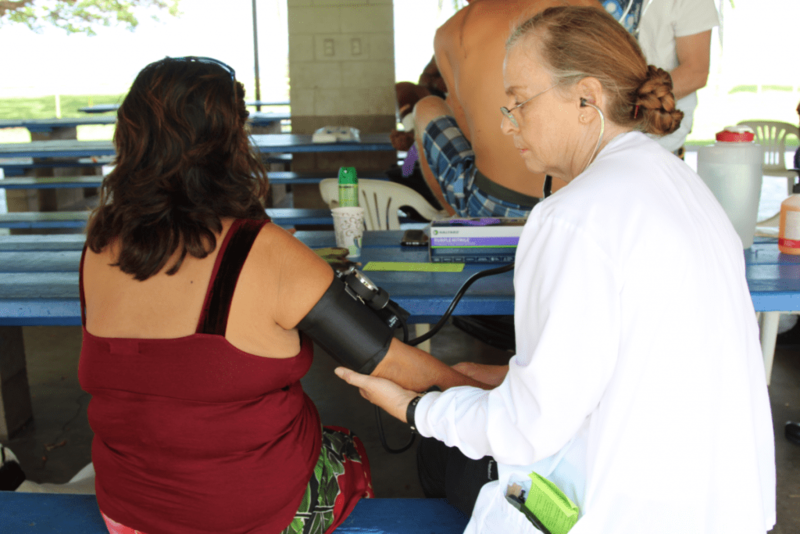 UH Maui nurse and instructor Carol Petith-Zbiciak performs a blood pressure test on a woman. Each week, The Salvation Army receives fresh fruit and food from nearby hotels, grocery stores and community partners. The donations are loaded into the homeless outreach vans, which head out to serve homeless individuals and families in Kihei, Paia, Kahului and Lahaina. Lt. Romelia Howard and Nurse Carol Petith-Zbiciak worked closely with homeless clients to provide medical care and prayer. The partnership with UH Maui is new. In addition to cleaning and bandaging wounds, the students and graduates educated the homeless about making healthier choices and getting clean and sober. They also distributed hygiene kits containing toothbrushes, toothpaste, bug spray and sunscreen. Baldwin said that most of the injuries or conditions she sees within the homeless population are infected sites due to intravenous drug use, infected bug bites, and high blood pressure.